September 21, 2018 September 21, 2018 by John W.
A decent autumn low pressure system moved in over the past 24 hours. * Pressure is heading up now, and it looks to be sunny tomorrow with normal temps (low 60s) for late September. Autumn is typically when we start seeing big wind storms. Our max gust so far today, Friday, has been 37 mph at 11:30AM. Winds are beginning to slightly trend down as of 5PM. Find it anytime on our Area page using the “Zone” selector at the top. Check out the big spread in temps across the state currently. 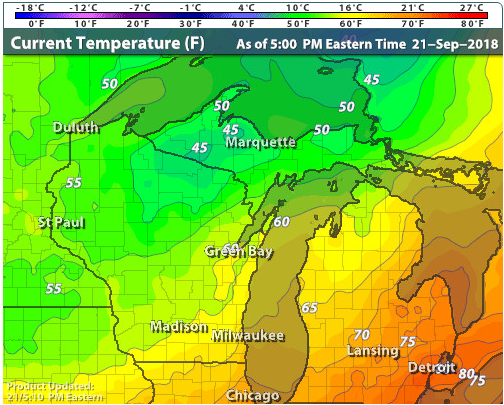 It’s still in the 80s in parts of Lower Michigan! Town should escape frost for the most part tonight, but it might be our coldest night since at least 9/9 (low of 44) if not last Spring. As always, we archive everything we measure on the weather history page. That’s where you can find out what weather is typically like this time of year or what it’s been like in past years. 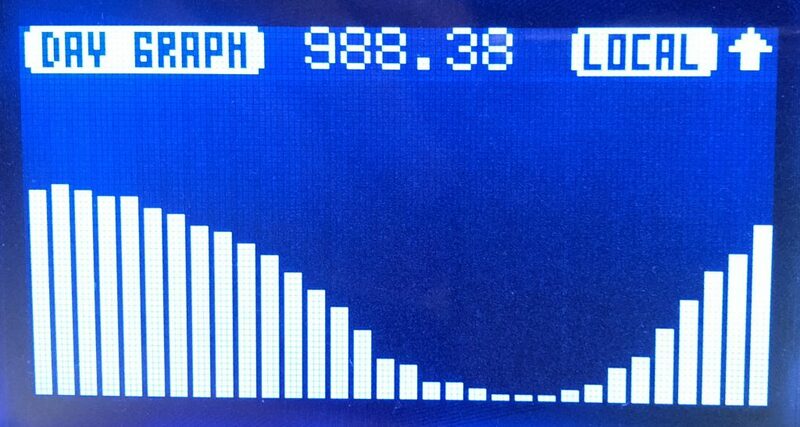 * We hit a minimum sea-level pressure of 29.33″ (993mb) at 7AM this morning. Not a shabby number, but we’ve seen lower. September 5, 2018 September 5, 2018 by John W.
We’ve received 3.11″ of rain at our location just north of the Vet’s Home since midnight. That’s an all-time record for our station. 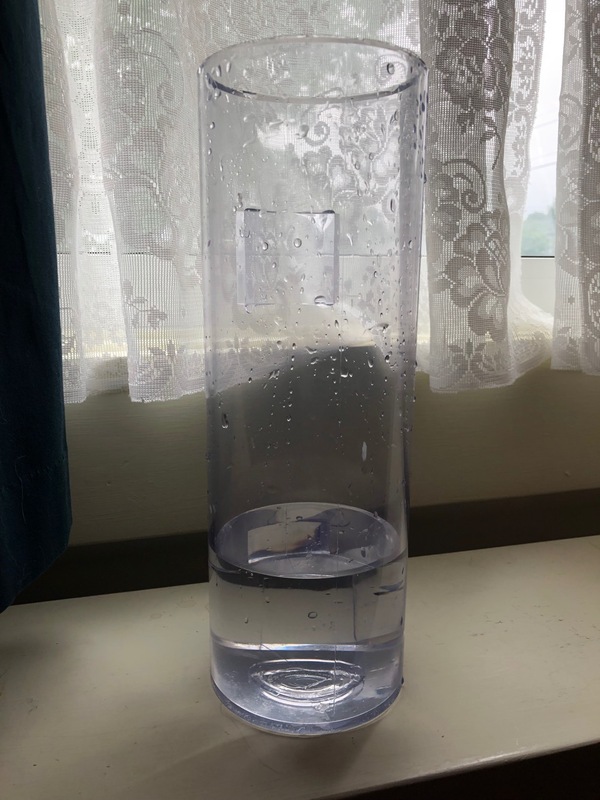 Unfortunately, our automated rain gauge had some issues overnight and missed 1 full inch of rain. Yikes! Normally, it is pretty accurate. For the last two big rainfalls (on 9/1 and 8/27) it read within a few percent of our reference gauge. I’ve now inspected the tipping bucket, cleaned it out (the cups were pretty dirty), and returned it to service. I’ll keep an eye on it. For today (9/5), I’ve overridden the automatic gauge with the manual measurement. You’ll see the wrong value in the stats graph at the top of the stats page. The precipitation tables further down the page should be correct, though. How big was that rain event? It looks like Marquette set a new daily rainfall record for September 5th for the 24 hours ending at 7AM this morning. The official COOP station at the Water Treatment Plant on Lakeshore Dr. reported 3.41″ during that time. The old record was 1.3″ set in 2007. By comparison, for the 24 hours ending at 8AM this morning, we measured 3.29″. Marquette has seen even greater rainfall in its history. On September 29, 1881, 4.44″ fell! Altogether since August 27th, we’ve recorded 7.51″ of rain! I don’t know if that’s a record stretch for the city, but it sure knocks my socks off! We took a small amount of water into our basement. Nothing serious, though. Apparently, we aren’t alone as there are reports around town of basement flooding. Let us know in the comments if you’ve been affected by all this rain we’ve had. September 4, 2018 October 23, 2018 by John W.
We are now adding 5% when humidity readings reach 95% since that is the maximum our sensor will read. For many years Davis Instruments’ sensors have struggled to achieve 100% humidity. Unfortunately, the problem seems to worsen with time. When we placed our sensor in service last November 28th, it would reach 98%. Also, we are adding 1% to 92% (to make 93%) , 2% to 93% (to make 95%), and 4% to 94% to reduce the jump between 91% and 100%. Tests demonstrate these adjustments closely approximate reality. 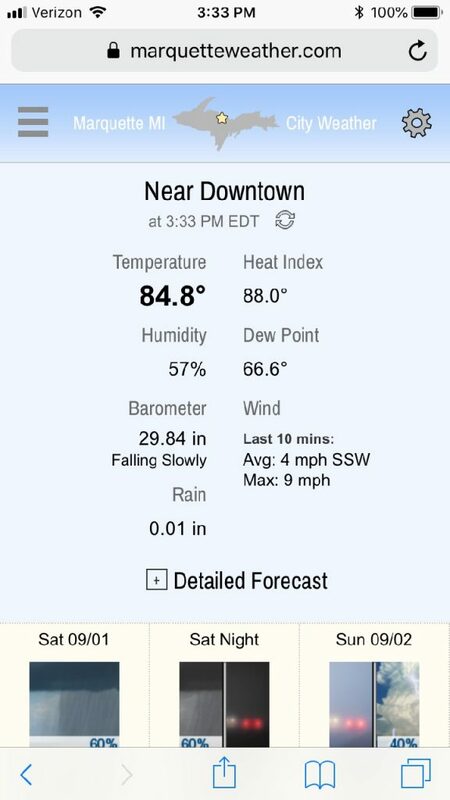 You may occasionally see other readings besides 93%, 95%, 98%, and 100% due to 5 minute averaging of humidity values. Raw values are available on the stats page. We have a backup weather station for emergencies. It also contains a Davis VP2 station with an SHT31 sensor that is less than 2 years old. It maxes out at 96% humidity, but it also has an average +8% bias below 80% during the warm season (May – Sept). So it has a wet bias in the middle range in addition to a dry bias in the top range. Keep in mind that the maximum error for this sensor is supposed to be 3.5% according to the manufacturer. We are not the only ones to experience these issues. 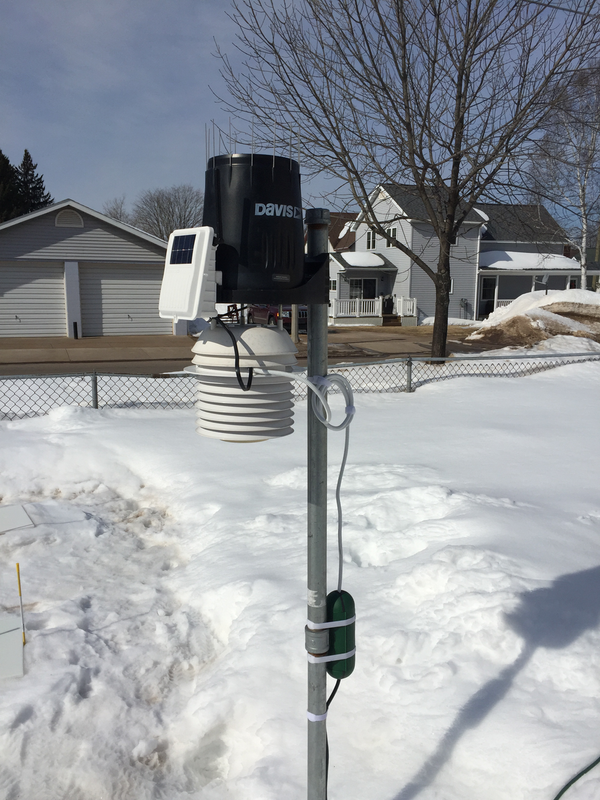 Many other Davis VP2 weather station owners have reported them (in a thread approaching 1200 posts). Davis says they are “looking into it”, although that was almost 2 months ago now. Some particularly brave souls have attempted to informally wire up older (SHT11/SHT15) and/or unsupported sensors (SHT75) with varying degrees of luck. We’re not keen on performing ad hoc experiments with our primary temperature/humidity sensor. Some combination of Murphy’s Law and common sense would argue that such slapdash “solutions” will inevitably break at the worst time. Indeed our various attempts with other sensors on the test bench have not gone well. Therefore, we await a viable, proven fix preferably from Davis Instruments. [UPDATE 10/23/18]: We recently swapped out our SHT31 sensor suite as part of a preventative maintenance routine. The new humidity sensor arrived with a +6% average (wet) bias below 55F, an average +4% bias above 55F and a maximum reading of 98% (after several hours in saturated air). We have corrected these deficiencies with custom programming. September 2, 2018 September 11, 2018 by John W.
I wrote about this yesterday on Twitter. Given the limitations of that platform, however, I couldn’t really go deep. Let’s dive in. July 24, 2018 July 24, 2018 by John W.
Last week I tweaked the color scheme to match the forecast icons. We’re keeping with the sky/water/sand theme only now just a bit brighter and more coherent. Today, I removed the weather history icons that lived beneath the current conditions. Nobody was clicking on them. The images accounted for about 1/3rd of the data necessary to load the home page. That wasn’t a good tradeoff between useful information and bandwidth consumption. I’m always mindful that people have limited data on their mobile plans. Speed is another concern too. I also moved the dropdown selector that was in the conditions section to the page settings (gear wheel icon in the upper right of home page). That’s where it belongs rather than cluttering up the current conditions. If you need to change the frequency of updates, it’s just one click to get there. Again, the data shows that few people adjust that setting, so why not put it where power users naturally go anyway? One more tiny detail. I added the time zone to the conditions and forecast update times. When visitors travel, they shouldn’t have to wonder if the times listed are local time or Marquette time. The forecast will always be updated in Eastern time. The conditions will be updated according to the current time zone selected on your computer or mobile device. In Marquette, they should both show “EST” or “EDT” depending on Daylight Saving Time. Also, I should mention that we recently changed hosts about 3 weeks ago. Regular, long-time visitors may remember some extended outages lasting hours, even days in one instance last year due to some lackluster planning by our old host, A2hosting. I picked out another Michigan hosting company, Liquid Web. Not only do they own their data center in Lansing (rare), but their operation is prepared to withstand power & internet failures, weather events, and DDOS attacks (coordinated hacking) among other unfortunate events. That’s not to say the site will never go offline, but, hopefully, not as frequently or for as long. It’s much more expensive to host with them, but their speed and reliability so far have been phenomenal. Well, thanks for visiting. If you enjoy the site, please tell your friends & family! Demolish Marquette to Improve Forecasts? July 3, 2018 September 3, 2018 by John W.
Would forecasts improve if we removed all the buildings, ripped out all the concrete and moved everyone to tents situated along Lakeshore Blvd? Short answer: likely. 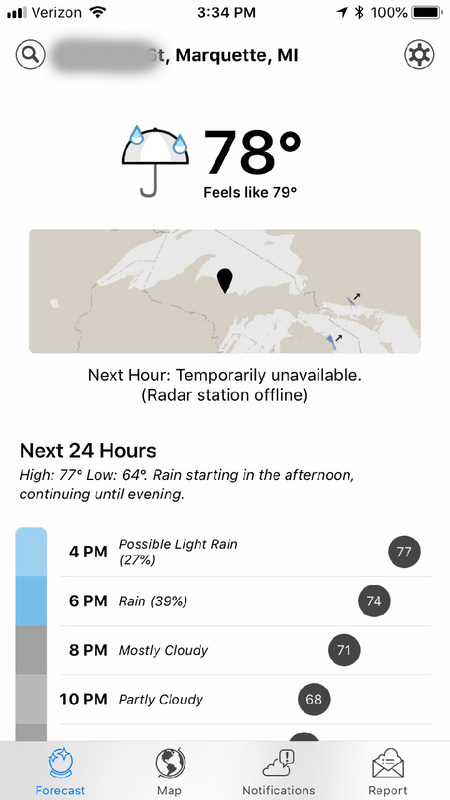 June 26, 2018 March 1, 2019 by John W.
The website’s featured forecast provider, Weather Underground (WU), announced a change in policy last month. They were no longer going to allow free, limited access to their raw forecast data (API). Instead, they would begin charging hundreds per month even to those who contribute data like we do. Since this site generates no revenue, the new price tag is a nonstarter. I’ve been exploring alternatives in hopes of continuing to offer dual forecasts. None of them have met my requirements of accuracy and affordability. Therefore, I’ve decided the National Weather Service (NWS) will be the sole forecast provider for marquetteweather.com. A New Stats Page is Born! March 23, 2018 April 4, 2018 by John W.
Synopsis: we are archiving the city’s climate and presenting it to the community in what we believe is an accessible and easy-to-read format. Perhaps you’ve visited the Statistics page previously. WeatherCat, the software that grabs data from the weather station, automatically generated those numbers and even uploaded them to the website. Well, the old saying “if it’s easy, it ain’t worth doing” proved true, unfortunately. As time went on, I kept spotting more mathematical errors. Plus, the tables were not very readable. Visitors couldn’t access daily history after 60 days. Navigating the page was difficult too. February 27, 2018 April 4, 2018 by John W.
So perhaps you’ve noticed lately on sunny days forecasted highs have been lower than the actual highs by several degrees. Well… it turns out that’s not entirely true. During the deepest part of winter when the polar vortex was regularly occurring (late December into January), we were having equipment issues. Normally, we measure temperatures inside an enclosure that has a fan running on solar power during the day and batteries at night. Unfortunately, the weather destroyed the electronics that controlled the battery charging, among other casualties. As a quick fix, we installed a passive (fan-less) shield for our sensor. Passive shelters are fine during our normally very cloudy, windy winters. Wouldn’t you know it, the sun decided to show up and, along with it, gentle breezes! That makes for beautiful winter days in Marquette. It is also a recipe for solar-induced sensor errors. February 23, 2018 April 2, 2018 by John W.
We measured 4.1″ out of the last system that passed through overnight and this morning. It was the light, fluffy stuff (15:1 ratio of snow to water). Almost 2.5″ fell between 7:00 and 9:30AM alone. Looks like some more snow will fall overnight Saturday into Sunday AM. Amounts are in flux at the moment. NWS is estimating 1-2″ and Weather Underground is forecasting 3-5″. Stay tuned! The WU forecast is updated every 20 minutes. NWS updates less frequently but we check once per hour.